All around the central installation, Habib Allah’s videos play on the walls—one of them is projected onto a large fabric that casts a shadow over the tiles and the audio plays through loudspeakers so viewers can hear the sounds from the film as they explore the other works in the show. The remaining two videos have headphones and provide a more centralized viewing environment. Habib Allah, a New York City and Miami-based artist, blurs the line between investigative research and artistic expression. The exhibition statement explains that “he homes in on economies of people, objects, images, tracing various ways of navigating through these networks or investigating their structures.” Curated by The Ren’s director Solveig Øvstebø, the exhibit operates more like a retrospective or archive of the artist’s work, rather than a show built from a central theme. 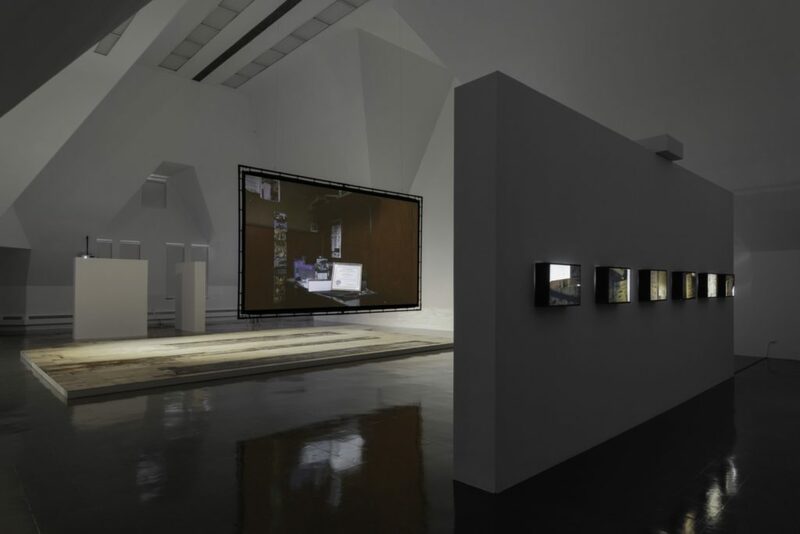 The darkness in the gallery evokes a movie theater setting, which is apt for his video work and themes of alternative economies and disenfranchised communities. The film “30kg shine” opens on a gooey blob slipping down flights of stairs and across cobbled alleys. I felt goosebumps watching the waxy mass stretch and contract to move through the streets. The next scene shows a woman frantically knocking down a wall to break into a house with objects that she claims used to be hers. The film ends at a construction site where men are digging holes into what used to be graves. These snippets of plotlines seem to have no connection to each other; even the text at the end doesn’t clearly explain the relationship between the different elements in the video, leaving the viewer to come up with their own conclusion. Despite revisiting his work several times, I was just as spooked and baffled by his themes in the second visit as the first. It took finding a text from the London- and Greece-based Rodeo Gallery, where it first exhibited in 2015, to learn that this film deals with the ‘condition of ownership’— from myths to corpses. There are two more films in the space: a video of mechanics assembling a fiberglass body around a video camera—the finished piece sits in front of the video screen on a pedestal—and a single-channel HD video titled “The King and the Jester.” All three of Habib Allah’s films share the same quality: disconnection. They all incorporate long reels of footage with multiple scenes, each bearing no obvious relationship to the scene before. With nearly an hour of combined footage, the films might function better if screened together at a theater or at a film festival. To me, the second-most successful piece of the show was “Dropping the 10th Digit”: a series of eight duratrans prints (a form of transparency film) mounted in light boxes. One of them has “David 38.00” and “Davidwife 36.25” scribbled on a scrap of paper, resembling handwritten store receipts made by a cashier. In an interview with Art in America magazine, Habib Allah explains that the title came from the method the Florida welfare agency uses to inform beneficiaries when they are going to get their money; the date the deposit will be made available is found in the eighth and ninth digit of the ten-digit case number. The most absorbing feature of Habib Allah’s work is the way he illustrates certain aspects of his research and completely neglects others. For instance, the vinyl-tiled floor looks almost identical to one in the first film, yet the history and background of this piece more directly references the subject of “The King and the Jester.” Meanwhile, the photo prints are another extension of Habib Allah’s research into how stores in Liberty City sometimes trade food stamps for cash. As if offering scattered pieces of a jigsaw puzzle, these prints shed light more directly on Habib Allah’s larger investigation into the way that government welfare affects marginalized and disenfranchised communities—like the ones in Liberty City. Manisha AR is the Weekly’s chief of staff and a writer who graduated from the New Arts Journalism program at the School of the Art Institute of Chicago. She is interested in film, video, performances and storytelling. When she isn’t researching for a story, she spends time playing with her cat and drinking coffee.